Singapore - the gateway to Malaysia. This page is for those, who want to stay in Singapore for a few nights. The city also offers unbeatable shopping, the pick of Asian and world cuisine, an enviable choice of accommodations and a wide range of recreation facilities. 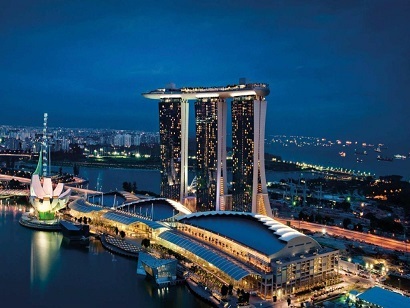 Marina Bay Sands is located in one of the world�s most iconic landmarks and premier lifestyle destinations. Emerge from the elegant comfort of your own room to relax in the utmost luxury at the world's largest rooftop Infinity Pool, while enjoying the panoramic view of the city�s skyline, or soar 57 levels above the heart of the city at the stunning Sands SkyPark Observation Deck. Savor exclusive culinary creations by the world�s best celebrity chefs: Tetsuya Wakuda, Wolfgang Puck, Gordon Ramsay, Mario Batali, David Thompson, Justin Quek, Daniel Boulud, and David Myers. Alternatively, let your imagination inspires you at Future World, the new exhibition at ArtScience Museum, where a spectacular interactive world is brought to life. Discover a curated collection of seasonal trends and a refreshing mix of international luxury brands at one of Singapore�s largest luxury shopping malls. Capture the breathtaking and memorable moments at Marina Bay Sands, where entertainment, dining, and retail offerings are set above and beyond the level of excellence. PARKROYAL On Pickering is renowned as Singapore�s hotel-in-a-garden and is conveniently located at the crossroads of bustling Chinatown and Singapore�s central business district. This luxurious award-winning hotel is within a short walk of key heritage attractions, including Thian Hock Keng Temple, Chinatown Heritage Center, Clarke Quay, and chic bars and cafes in Ann Siang Hill and Club Street. The 367 elegantly furnished guestrooms and suites offer spectacular views of the city and the hotel�s sky-gardens. All rooms come with complimentary Wi-Fi and broadband Internet access, in-room amenities, and a well-stocked Executive Bar. A dedicated wellness floor is available on level 5! Work off the jet lag, enjoy a relaxing dip in the outdoor infinity pool, or simply unwind in one of the unique birdcage-inspired cabanas. For a truly sensational holiday, pamper yourself with holistic body and beauty treatments at the award-winning Singapore�s St. Gregory Spa. Conveniences include a tour desk, business center, and meeting spaces catering for up to 500 guests. Enjoy a repertoire of Asian cuisine, savory Peranakan dishes, and international specialties at LIME, an open-kitchen concept restaurant and bar located on the street level of the hotel. Additional benefits awaits Orchid Club guests at the Orchid Club Lounge. Situated in the city center on Orange Grove Road, this large and luxurious hotel is just a short walk from Orchard Road, Singapore�s main shopping and dining area. Shangri-la Hotel Singapore has 747 guestrooms and suites in three distinctive wings - the contemporary Tower Wing, the nature-inspired Garden Wing, and the exclusive Valley Wing. 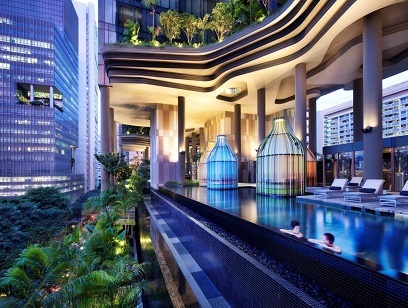 Shangri-la Hotel Singapore allows guests to leave the hustle and bustle of the city behind as they can unwind in the hotel�s various recreational facilities including a spa, a 24-hour state-of-the-art gym, a tennis court, and an outdoor swimming pool. There are even beautifully landscaped, 15-acre gardens with a variety of plants and flowers. The hotel has several excellent dining options ranging from international cuisine at The Line and classic Cantonese at Shang Palace to delightful high tea at The Rose Veranda. If you�re looking for the most convenient choice in town offering great value for money, look no further than Shangri-la Hotel Singapore. 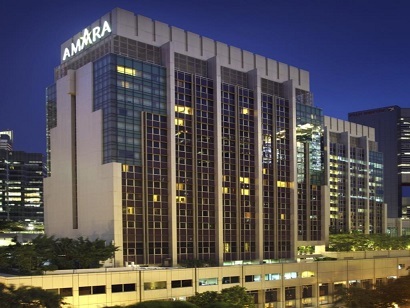 Amara Singapore is located in Singapore�s thriving central business district and is a mere two minutes away from the Tanjong Pagar Station. It features 392 rooms, eight dining options, and boasts a Balinese-styled pool and spa. Free Wi-Fi access is available in all areas. This business hotel in Singapore is easily accessible by major transportation modes and is within walking distance to the fascinating Chinatown, the Tanjong Pagar Conservation District, key office buildings, banks, shops, as well as dining and entertainment establishments. Chinatown is a great choice for travelers interested in shopping and culturally diverse food. The 100 AM, a lifestyle mall, is right at the hotel�s doorstep. Orchard Road, Sentosa, and Universal Studios Singapore are about a 15-minute car ride away. Amara Singapore features a total of eight restaurants/bars which serve local cuisine as well as Japanese, Korean, Thai, and French dishes which will surely please your palate. 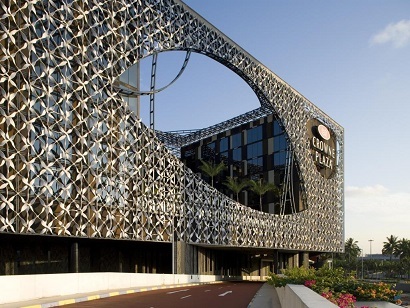 Crowne Plaza is a luxurious hotel located within the Singapore Changi International Airport. 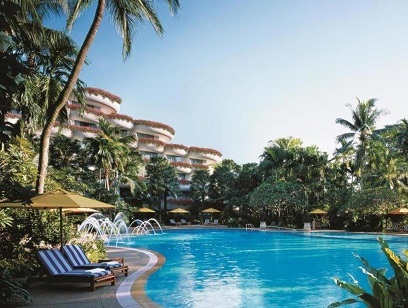 It offers stylish accommodation with an outdoor landscaped pool, a fitness centre and 2 restaurants. Trendy guestrooms at Crowne Plaza are spacious and boast an elegant interior with lavish designs. Bathed in plenty of natural light, each well-appointed room has a minibar and flat-screen TV with cable channels. The en suite bathroom boasts a rain shower. Changi Airport Crowne Plaza is accessible from Changi Airport�s Terminal 1 and 2 by a monorail system. 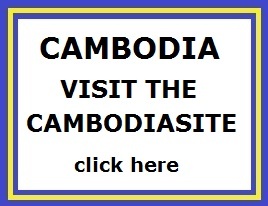 It is linked to the airport�s Terminal 3 by covered walkways. The city centre is a 30-minute drive from the hotel. Crowne Plaza Changi Airport offers laundry and same day dry cleaning services. To unwind, guests can enjoy a relaxing massage at the hotel�s treatment rooms. Some rooms offer benefits of the Executive Club Lounge which include complimentary cocktails and meals. Cantonese dishes are offered at the hotel�s Imperial Treasure Restaurant. Azur Restaurant features open concept kitchens serving Eastern and Western dishes all day. Wine and light refreshments can be enjoyed at bar75. 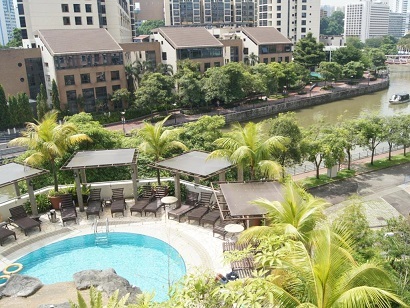 This riverside hotel offers a stunning view of the Singapore River and is within walking distance to fashionable Clarke Quay. The Robertson Quay Hotel is conveniently a five-minute walk from Singapore�s premier entertainment spot of Clarke Quay, where hundreds of restaurants, bars, and night clubs can be found. The Clarke Quay MRT station is slightly farther away. Orchard Road is also a comfortable 10-minute walk from the Robertson Quay Hotel. The modern guestrooms are compact but extremely comfortable and fantastic value for money. 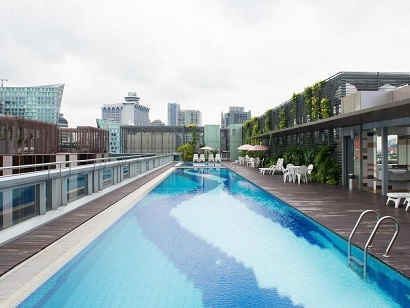 The rooftop swimming pool, complete with a waterfall feature, offers a great place to unwind and enjoy a panoramic view of Singapore. Hotel Chancellor@Orchard is centrally located on Orchard Road where shopping, entertainment, and dining destinations are just minutes away. It is within a five-minute walk to Somerset and Dhoby Ghaut Mass Rapid Transport. Changi International Airport is just 17km away or a 20-minute drive from the hotel, and it is a 10-minute train ride to Bugis Village, Chinatown, or Little India. The hotel features 488 rooms with a desk, a safety deposit box, bed linens, a three-temperature water dispenser, and a bathroom with a shower and hair dryer. A 32-inch flat-screen Internet-ready LED TV, coffee/tea facilities, and high-speed Internet are included. Bistro@Chancellor Cafe serves a buffet breakfast every morning. It also has an alfresco seating area for those who prefer some morning sun. Other facilities offered are a 24-hour front desk, outdoor rooftop pool, meeting facilities, luggage storage, children's playground, and coin-operated laundry machines.